The Highline district is pursuing the 'grow your own' idea: helping instructional aides become full-fledged teachers — and guiding current students toward teaching careers. In Highline Public Schools, district officials have set an ambitious goal of graduating all students as bilingual by 2026. There’s at least one big hurdle to making that happen: Where do you find enough bilingual educators to teach those students in multiple languages? Recruiters already travel to job fairs across the country — and even to Puerto Rico this year — to find Spanish- and Vietnamese-speaking teachers to fill classrooms in the district’s expanding dual-language programs. The district also is helping bilingual instructional aides complete their bachelor’s degrees to become teachers. Still, normal teacher turnover rates and competition with other districts make it hard to fill Highline’s growing number of bilingual teaching positions. “We’re probably reaching a limit of what we can recruit through more traditional means,” said Bernard Koontz, Highline’s executive director of language learning. Highline is one of the districts that plans to compete for a new state grant aimed to help them recruit, prepare and mentor bilingual high-school students to become future bilingual teachers and counselors. 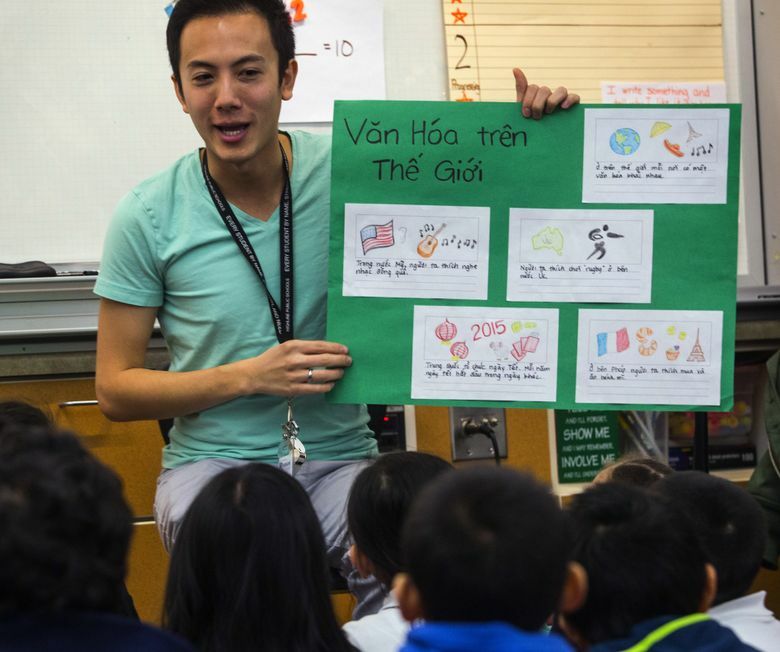 As part of a larger bill to expand dual-language instruction in the state, the Washington Legislature this year approved $400,000 for districts — at least one on each side of the Cascades — to design and start “grow-your-own” teacher academies for bilingual positions. Already, the need for bilingual teachers is great. During the 2015-16 school year, more than 130,000 students were identified as English learners, an 8.7 percent increase from the prior year, according to the state Office of Superintendent of Public Instruction. And of the 3,670 school workers providing instruction and support for those students, 45 percent were instructional aides. “In other words, they’re not certified teachers … That’s a formula for setting kids up to fail,” said Ricardo Sánchez, a member of the state Board of Education. Sánchez, formerly with the Commission on Hispanic Affairs, lobbied the Legislature for passage of the new state grants. An earlier bill in the Senate included about $1.5 million for the program, and that money would have paid for conditional loans that bilingual students could have used to study education in college. To avoid repaying the loans, the students could have taught or worked as a counselor in their home communities for at least five years. Now, smaller-scale grants will provide only the seed money for districts to begin building their “grow-your-own” programs, and additional funding for student scholarships would have to come from future legislative sessions. “At this time, with just a very limited amount of money available, we anticipate that will go predominantly for planning and instructional-support pieces,” said Alexandra Manuel, who oversees teacher preparation programs for the state’s Professional Educator Standards Board. Koontz, with Highline schools, said his district likely will partner with other districts to apply for the grants. “If we did it on our own, it would be like having a bike to ride versus a Harley,” Koontz said. “Regardless, we’ll do something. We have to. It’s imperative that we talk to our kids about careers in teaching,” he added.